A plaque in honour of a biologist known for his work in genetics has been installed at his former Oxford school. John Burdon Sanderson Haldane won a number of prizes, including the French Legion of Honour, for his mathematical work on genetics, which was pivotal in the acceptance of natural selection. 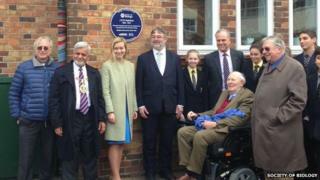 The plaque has been unveiled at The Dragon School - formerly the Oxford Preparatory School - in Bardwell Road. It is one of 10 being installed around the UK by the Society of Biology. JBS Haldane was a polymath biologist, meaning his expertise spanned several fields of study. Part of his work was to combine evolutionary theory with modern genetics. The ceremony was attended by Sir Roger Bannister, who ran the first sub-four-minute mile in Oxford in 1954, Nicola Blackwood, MP for Oxford West and Abingdon, and Lord Mayor of Oxford Mohammed Abbasi. Dr Mark Downs, chief executive of the Society of Biology, said: "We have a great heritage of scientific discovery and an exciting future, but the biologists who have contributed to our understanding of the world are not always given the appreciation they deserve. "We are delighted to be giving these biologists the recognition awarded to other great historical figures."